Meeting at the Tbilisi International Airport. Transfer to the hotel. Overnight. Drive to Tsinandali. Visit Alexander Chavchavadze House Museum. Tsinandali is a village in the Kakheti region of Eastern Georgia, noted for the estate and its historic winery which once belonged to the 19th-century aristocratic poet Alexander Chavchavadze. There is kept a unique collection of wine from many countries. Familiar with European ways, Chavchavadze built Georgia’s oldest and largest winery where he combined European and centuries-long Georgian winemaking traditions. Overnight in Telavi - the main city and administrative center of Georgia’s eastern province of Kakheti. Telavi State Museum colmplex includes the memorial place of the Kakhetian King Erekle II, a court church, a philosophy school, a bath and tunnel built by Erekle II. Alaverdi Monastery is a Georgian Orthodox Monastery. Parts of the monastery date back to 6th century. The present day cathedral dates to the 11th century. At a height of over 55 meters, Alaverdi Cathedral is the second tallest religious building in Georgia, after the recently consecrated Tbilisi Sameba (Holy Trinity) Cathedral. 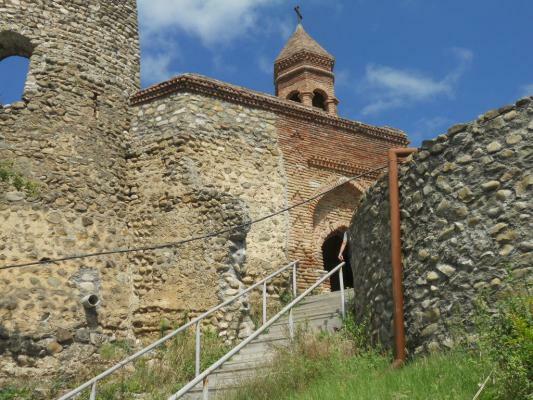 Shuamta – two of the most important and the most beautiful architectural monuments of kakheti are the Dzveli (“old”) 6th century and Akhali ( “new”)16 th century Shuamta Monasteries. Both of them stand in a forest of deciduous trees which makes them look even more fascinating. Drive to Gori. The city was founded by one of the greatest kings of Georgia – David the Buider (1089-1125). Gori is also known as the birthplace of the Soviet leader Joseph Stalin. Visit Joseph Stalin state museum. Drive to Uplistsikhe (literally, “the lord's fortress”) is an ancient rock-hewn in eastern Georgia. Built on a high rocky left bank of the Mtkvari River, it contains various structures dating from the Early Iron Ages to the Late Middle Ages, and is notable for the unique combination of various styles of rock-cut cultures from Anatolia and Iran as well as the co-existence of pagan and Christian architecture. Drive to Borjomi - is a resort town in south-central Georgia. The town is famous for its mineral water industry (which is presently the number one export of Georgia) Visit Borjomi Park. Mineral water tasting. Drive to Bakuriani. Bakuriani is a popular skiing resort, located on the northern slope of the Trialeti Range, at an elevation of 1,700 meters above sea level. Drive to Vardzia. Cave town Vardzia (XII century) is one of the most important and impressive historic monuments in Georgia. Vardzia is located at the altitude of 1300 meters above sea level. Drive back to Tbilisi. Dinner in the traditional Georgian restaurant with folk music and national dances. Lake Sevan – pearl of Armenia, is the largest lake in Armenia and one of the largest high-altitude lakes in the world, situated in the central part of Armenia. Yerevan is the capital and largest city of Armenia and one of the world's oldest continuosly0inhabited cities. Situated along the Hrazdan River. Yerevan is the administrative, cultural, and industrial center of the country. Drive to Etchmiadzin. Etchmiadzin Cathedral – is the head quarters and official residence of the Catholics of all Armenians. The Etchmiadzin Cathedral is the oldest state-built church in the world (4th century), the same period when Armenia adopted Christianity as official religion. Visiting the church of St.Hripsime (7th century) which is a short distance away from the cathedral. Drive to Zvartnots. Matenadaran is an ancient manuscript repository located in Yerevan. It holds one of the world's richest depositories of medieval manuscripts and books which span a broad range of subjects, including history, philosophy, medicine, literature, art history and cosmography in Armenian and many other languages. Drive to Garni - is a temple complex located in the Kotyak Province of Armenia. The first traces of human occupation date back to the 3rd millennium BC. In the 8th century BC the area was conquered by the Urartian king Argishti I. The first literary testimony to the existence of a fortress on the spur crowning the site of Garni comes from the Roman historian Tacitus and dates from the middle of the 1st century AD. The particular interest is the bathhouse located in the northern part of the site. Drive to Geghard Monastery is a unique architectural construction in the Kotayk province of Armenia, being partially carved out of the adjacent mountain, surrounded by cliffs. (13th century) It is listed as a Unesco World heritage Site. Drive to Khor Virap - is an Armenian Apostolic Church monastery (17th century), located in the ararat plains, vine yards and faces to Mount Ararat. The monastery had a theological seminary and was the residence of Armenian Catolicos. On the way to Noravank it is possible to have wine degustation in Areni. Noravank is a 13th century monastery, located 122 km from Yerevan in a narrow gorge made by the Darichay river, nearby Yeghegnadzor city. The gorge is known for its tall, sheer, brick – red cliffs, directly across from the monastery. Noravank was founded in 1205. Departure. Transfer to the Yerevan International Airport.